The concierge app allowing the more convenient use of Paradise City! Enjoy faster and smarter checking of your exclusive benefits, reservation information, and various convenience services through the concierge app. 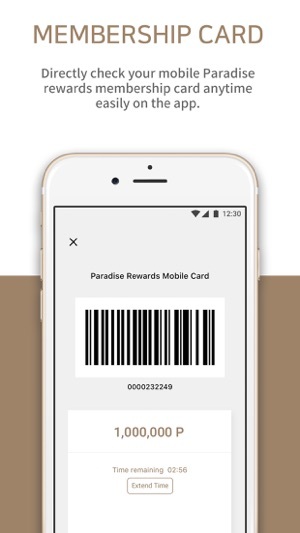 - MY PAGE: Information about the user’s Paradise rewards mobile membership card, point records, viewing and using MY Coupon, and reservation history are present. - E-CONCIERGE: Provides services on requesting the guest-exclusive housekeeping and amenities, in-room dining request, and finding the parking area. 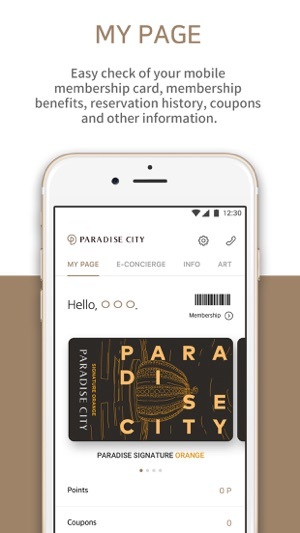 - INFO: Users can understand all of DINE&DRINK, activities, diverse events and offers, facilities information and shuttle bus information that they can enjoy in Paradise City. 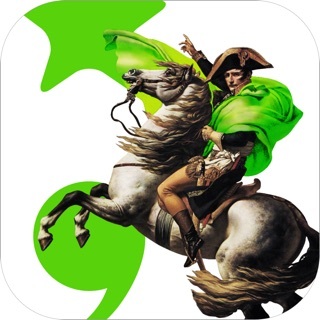 - ART: Users can find out the artworks information and the art map of Paradise City. Meet the true art-tainment resort complex Paradise City! In April 2017, Paradise City suggested the new paradigm in the tourism industry by introducing ‘art-tainment resort’ and opened the era of the resort complex in Korea. One year later since its establishment, Paradise City has become an attraction for enjoying the vacation in a hotel through its contemporary and luxurious rooms along with personalized services. Also, it has been an attraction for international conferences/events due to its optimized facilities and excellent accessibility to the Incheon International Airport, and an attraction for movies, dramas, CF, M/V filming sites loved by lots of celebrities by its artistic facilities. As the secondary facilities of the boutique hotel Art Paradiso, spa CIMER, club CHROMA, gallery Paradise Art Space, Plaza, and others will be opening in September 2018, Paradise City will further become a landmark of the Northeast Asia tourism where people can enjoy more dynamic entertainments beyond the impressive cultural and artistic aspects. Experience the true relaxation and leisure, impressive cultural and artistic activities, and the new level of joy coming from active events all at Paradise City. 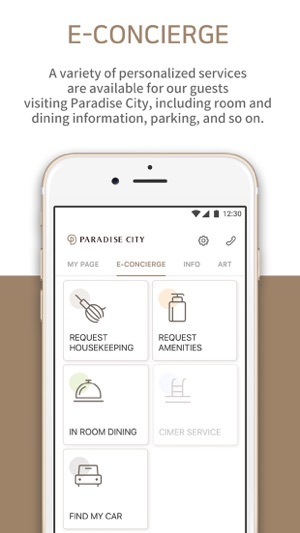 We would like to introduce the new Paradise City concierge app featured with better convenience. Additional in-room dining requesting functions for room guests. 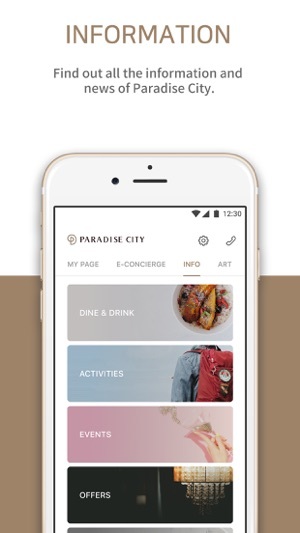 The new version of the Paradise City concierge app achieved with the total change in overall design and UX/UI. Reservation history views for members/non-members, and additional function for viewing one’s coupons and using coupons offline by providing coupon barcodes. 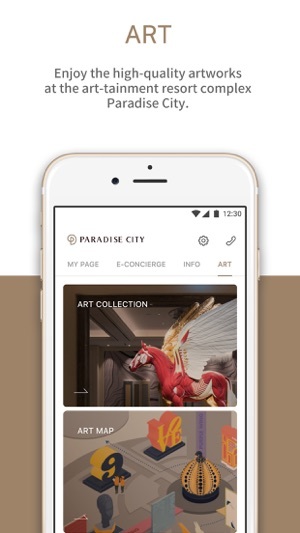 Provides the differentiated information only found at Paradise City which is the art map for artworks, by including various information about diverse events, activities, and products of Paradise City.